For Burying your Electronics, Guns, Documents and More! First time burying something underground? Feeling paranoid? Don’t worry, burying valuables underground used to be considered crazy or extreme; but since the Y2K and Mayan apocalypses, survival prepping has gone mainstream. If you’ve never considered this option before you will quickly find that there are dozens of survivalist websites, forums and blogs to get you started. Best tools for digging? …in my humble opinion, are shown in the photo below. 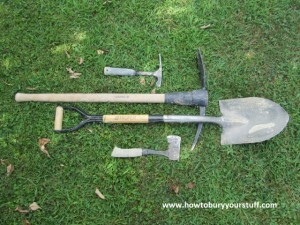 A small hatchet, a small flat pick, a mattock and a shovel should be all you need. Although I have never needed them, in some situations you may also find post-hole diggers to be useful. A common term used to define an underground stash is “cache” and here are 10 tips, just some suggestions to consider in order to give your valuables maximum security. 1 – I would feel remiss if I didn’t state the obvious. Do not tell anyone where your cache is, no one. Period. Not your spouse, best friend or child. That one person who you really really trust will tell someone else that they really really trust and so on. Ensure that no one follows you to your caching location and do not repeatedly travel back and forth. Do not draw any maps or directions; the only directions should be the ones locked away in your own memory. If you can help it, don’t even tell anyone that you have a cache at all. Be creative and build multiple caches as backup or you could even ‘mark’ a false location as a dummy cache. 2 – If you are concerned about hackers or electronic surveillance then don’t use your Garmin to locate your hiding spot. When digging or checking on your underground cache, do NOT take your cellphone with you. Leave all of your electronic devices at home, including your digital camera. You do not want any electronic record of you ever having been at this location. Also remember that your vehicle’s Tom-Tom, OnStar or LoJack can also be your undoing. 3 – Remember “High and Dry” and stay away from lakes, rivers, valleys and any flat area of ground. The water table of any flat area, regardless of elevation, can hold large amounts of water for an extended time. You want to dig on hilltops, hillsides and ridges; far away and above any body of water. 4 – When choosing a location, try to find a place as close to home as possible but far enough away that it cannot be found by simply sweeping your backyard with a metal detector. If you live in a rural or suburban area, then this should be easy enough. If you live in a strictly urban setting, then you may be forced to choose a location that requires driving some distance. In an ideal situation, you want your cache located on or near a hilltop, in a wooded area within walking distance of your home that is unlikely to be disturbed by construction or logging companies. 5 – You’ll have to research your location’s “frost line” (those who live in Calgary will have to dig deeper than those who live in Juarez) and try to place the top of your container at or below that depth. I’ve buried above the frost line before and never had problems; but if you’re not checking your cache at least once a year, then you will want to get below the frost line. Burying above the frost line means extreme changes in temperature that will cause something called ‘frost heave.’ This can not only actually move your items around, but can cause condensation inside your containers. Frost heave can also crush your containers. 7 – While constructing, arranging, placing and covering your cache, actually picture the water running uphill and remember that this is a scientific impossibility. Water flows downhill and this is the basis for what I call my “Bell Method.” The Bell Method is based on the fact that you can take an empty drinking glass, turn it upside down (like a hanging bell) and push it down into a bucket of water. Anything attached to the bottom of the glass would remain perfectly dry. I started using this concept during my teenage years and no matter how deep underwater (within reason) there will always be a pocket of air inside. In the following webpages, I’ll go into more detail about the Bell Method and include some photographs. 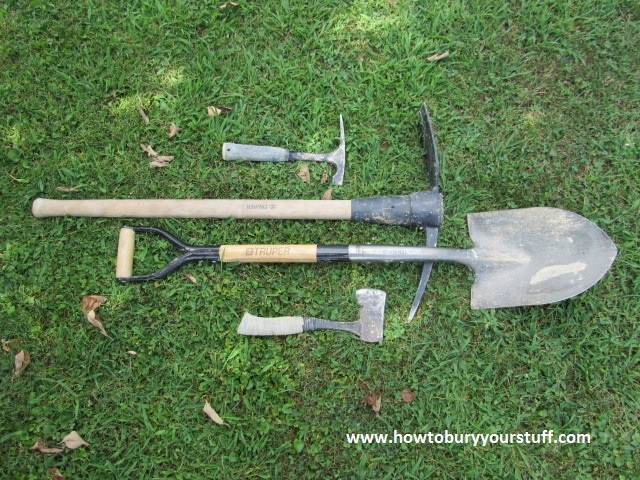 8 – Insulate whatever you are burying against rapid changes in temperature. It’s useless to waterproof something only to have moisture condensate inside your sealed container. Take an empty 20 ounce Coca-Cola bottle, rinse and dry it out completely. Screw the lid on tight and alternate placing the empty bottle in the freezer, then outside on a hot summer day and back in the freezer again. Sooner or later, if you continue to do this, moisture will start appearing on the inside of the bottle. This is the exact same thing that can easily happen to all of your ammunition, each circuit board, each paper document and each firearm you bury underground. Burying below your area’s frost line and using temperature insulation is critical. 9 – Steel wool will rust very easily. Buy some fine grade (0000) and place a piece of it with whatever you are burying. Say for instance, that you dig up your cache once a year and check everything out. Every year you should place that exact same piece of steel wool back into your container(s), if the year ever comes when it suddenly has rust on it; then you know that you have a problem. 10 – Lastly, I want to reemphasize my first tip. Do not tell anyone anything about the location of your underground cache. Burying your valuables keeps them absolutely safe because of the single solitary fact that no one knows where they are. If your geocaching is the result of a group project, then make damn sure you can trust your fellow preppers with both your property and quite possibly your life; furthermore, whether you are digging in an urban, suburban or rural environment remember that there are probably more people watching you than you realize. Use common sense when traveling to and from your location, wear camouflage or dark clothing and try be quiet when digging. Be sneaky, dig at 4:00am during a full moon without using a flashlight or be creative; only visit your cache during a severe thunderstorm.